RD Mama: Wake Me Up Before You Glo-Go! Yesterday Porter's preschool hosted a dynamite fundraiser. It was glow-themed dance party! It is amazing to me to see how much money we can raise with all the creative, talented parents and a super low overhead. The venue generously donated their location, Tim & another dad pulled together a playlist, a third dad played DJ, we rented and borrowed some glow lights, teachers pulled together face paint glow crafts, someone hit up the wholesale toy district downtown for cheap glow loot and Ta-Da: Instant Good Time! For the weeks leading up to the event, Porter was dead set on wearing this crazy awesome silver shirt. I think it lived up to his expectations as a party conversation starter. Watch out, he may laser you with his glow fingers. There was an epic limbo competition. Stella even got in on the glow-action! It looked spectacular under the black lights and even cuter passed out after dinner. 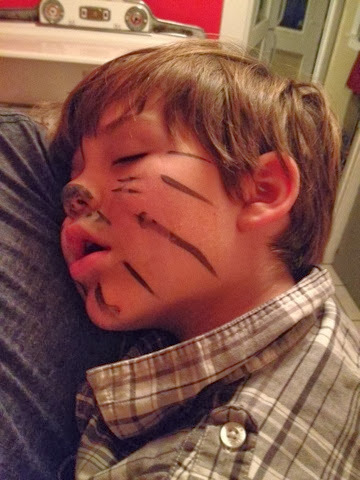 Poor tired out dancing tiger. A ton of Matilda's current school friends and preschool alumni friends turned up. This event was the perfect fit for her older crew of friends and they had an absolute blast. Matilda's only complaint of the day was that somehow no one ever played her new favorite Wham song.